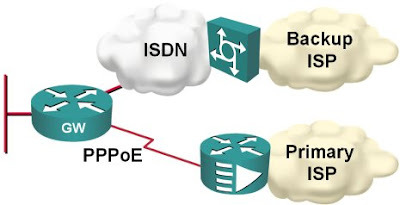 However, as I'm using PPP encapsulation on the primary connection, there's another option: PPP can insert a dynamic default route whenever IPCP negotiations succeed (and remove it when the line protocol goes down). To configure this feature (introduced in IOS releases 12.3(11)T and 12.4), use the ppp ipcp route default interface configuration command on the primary dialer interface. You have right but it doesn't works if I have ethernet as WAN interface. I mean clean ethernet, without pppoe. Reliable static routing helps in this case. Hello friends, Ivan, you are very intelligent. I have a question, Is it good if I use the static default route ip route 0.0.0.0 0.0.0.0 Dialer0. Istead of ppp ipcp route default? As always, it depends on what you're trying to do. If you want the default route to always point to Dialer0, then your solution works perfectly. I am huge fan of yours, just to verify if I have 2 DSL links and I want to use one as primary, I could to ppp ipcmp route default on my primary and do a floating weighted static route on the secondary? or let us say I have an ethernet(bgp) + dsl service and I want to make the DSL as my primary, I could just use this as well and if my dsl goes down my ethernet bgp would just take over? "... if my dsl goes down my ethernet bgp would just take over?" << assuming you're getting just the default route over BGP, otherwise the router would use the more-specific entries you get over BGP.